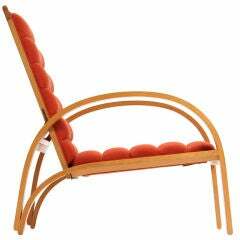 Chair in ash and cane designed by Ward Bennett, and produced by Brickel Associates, circa 1975. Newly caned. This is arguably Bennett's best chair design. Upholstered seat pad currently being re-upholstered. We can have the seat pad re-upholstered (COM) for an additional $30.00 Measures: 30 3/4" tall x 21 5/8" deep x 24 1/2" wide, with a seat height of 16 3/4" (without seat pad). Newly caned. Newly upholstered seat pad to be added soon. PP203 armchair in black lacquer with leather seat, designed by Hans Wegner, circa 1969. Produced by P.P. Mobler in Copenhagen, Denmark. 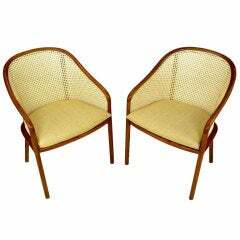 An upholstered arm chair with tubular ash frame, raked back and slanted seat. 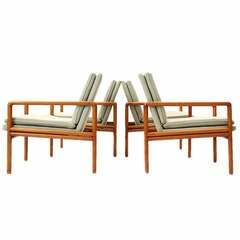 Ward Bennett (1917–2003) Set of four shapely armchairs by Ward Bennett for Brickel Associates in black lacquered nut wood with burgundy wool upholstery. Ward Bennett scissor chair in very good condition. 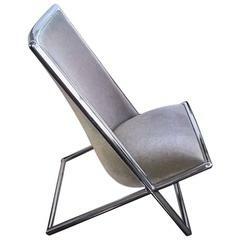 Chrome frame scissor chairs by Ward Bennett with white leather. 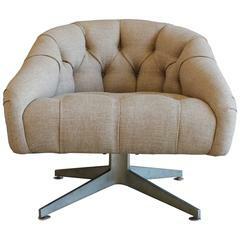 Swivel tufted lounge chair by Ward Bennett for Lehigh Leopold.